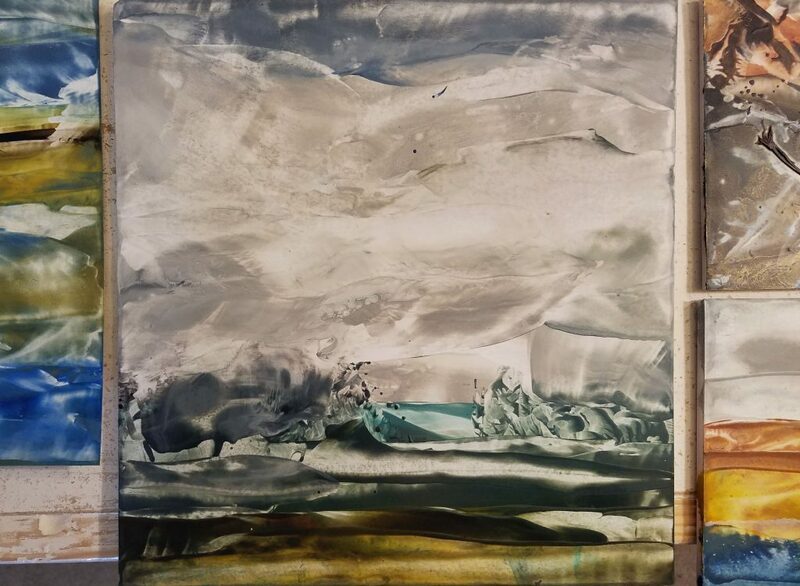 Above, center: Rain over Marshlands, encaustic wax painting, 10.5″ x 11″. © 2016. 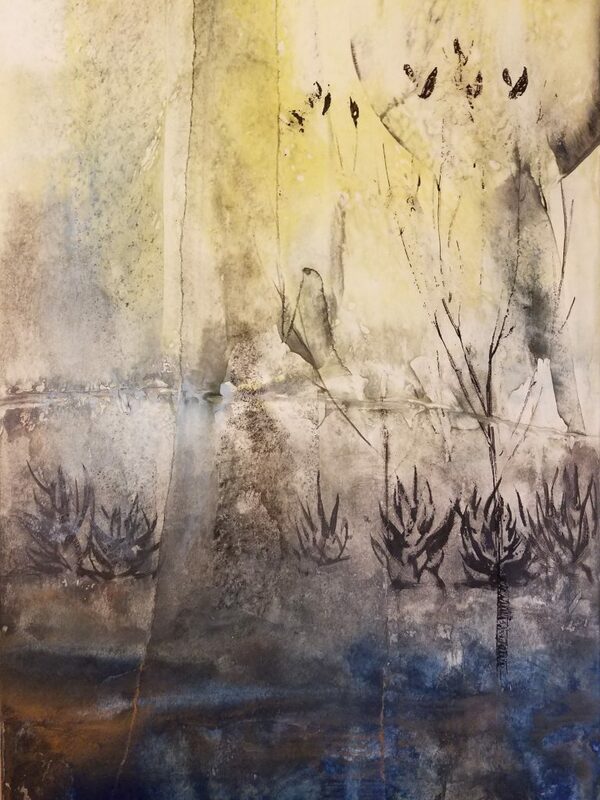 Today was a studio day, working on inspiration from yesterday’s trip to the marshes and experimenting with drawing and layers of wax paper. 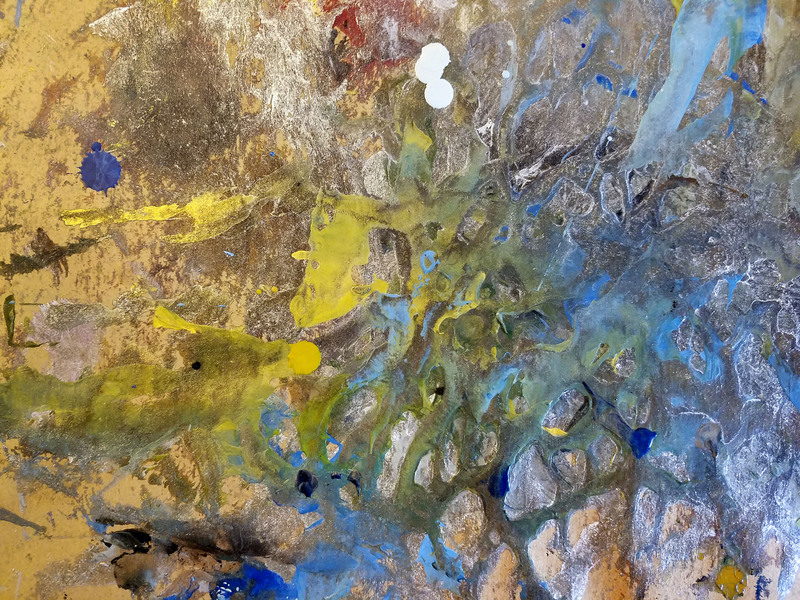 Not being an abstract artist has made this an interesting process for me. My thoughts as a realist painter and nature photographer tend to focus on editing reality for the best composition and color. It has been different to work from an instinct and memory of what I saw, heard, and felt, using composition and color to express the mood before the image. It feels much more intentional, since I need to have a clear idea of my emotional goal and then make visual choices to support it. This way of working will improve my realism as well. Left: First experiments with layering wax paper and ink. 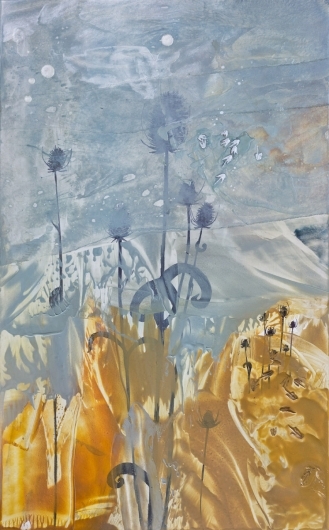 Right: Wind Seeds II, encaustic wax painting with collage, found objects and ink, 11″ x 18″. © 2016. I am naturally a lazy artist. I see beauty, and I try to record it. It takes a lot of energy to add a step in between, to consider what exactly has captivated me, and what I am trying to express by creating this record of beauty. My ceramics professor could make beautiful, detailed objects, but she didn’t spend much time doing so, believing there are enough objects in the world and her time is better spent working with others toward social change. I remain in love with making objects, but this gave me a feeling of greater responsibility towards their creation. If I am going to make objects in a world filled with them already, I had better be sure they are worth making – definitely to me, and maybe to others as well. Work surface after 5 days. It may be time to put down a new piece of butcher paper.